We're not sure whether it's the great weather, the crisp ocean breezes and salt air, or the motivation of wanting to work up an appetite before eating at one of Wrightsville's many great restaurants, but both vacationers and residents of our little island seem to love to stay active. There is no shortage of ways to work up a sweat in Wrightsville Beach - choose your favorite or try something new! You'll see serious runners, people out for a casual stroll, parents pushing strollers, and lots of four legged training partners out for a jog with their people. Explore the marshes that are teeming with wildlife, or take a shorter surf kayak into the waves. Rentals available from Saltmarsh Kayak Co.
Get in a workout or just explore the island on wheels. A beach cruiser is the ideal mode of transportation to take to the beach, grocery store, or out to lunch on a beautiful summer day. 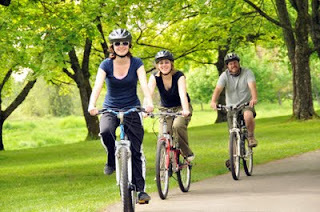 Bike rentals are available from Bike Cycles in Mayfaire Community Center, just minutes from Wrightsville Beach. Hang 10! Give one of Wrightsville Beach's most popular pass times a try with a lesson from WB Surf Camp. Board rentals also available from several area surf shops. More than the latest craze, Stand Up Paddleboarding, or SUP, is an amazing way to explore the coast. Head into the waterway, the marsh, ride the waves, or paddle beyond the breakers. Rentals and excursions available from Hook, Line & Paddle. If you're really looking for an adventure (and a great workout!) give Kiteboarding a try. You'll ride a wakeboard-type board that is powered by a giant kite. The pros are really fun to watch as they pick up speed and get some major air! Contact IndoJax Surf School for information on lessons. Grab your racquet and head to Wrightsville Beach Park where there are 4 public hard surface courts available. If you're staying at the Holiday Inn Sunspree or The Blockade Runner you can make use of the sand volleyball courts there. Otherwise get some friends together at the public court at Wrightsville Beach Park. Play a pickup game at the courts at Wrightsville Beach Park. If you're interested in making this active community your full time home or permanent vacation paradise with a second home, give Hardee Hunt and Williams a call to learn about available Wrightsville Beach Real Estate - 800-852-1605.